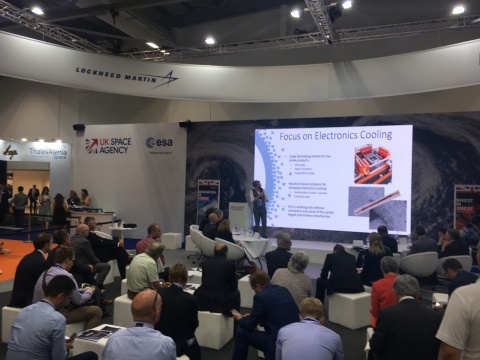 Six space-related UK tech start-ups got the chance to pitch their groundbreaking innovations to some of the world’s biggest space companies at this year’s Farnborough International Airshow. The ‘Pitch to Primes’ technology showcase, an event run by the UK Space Industry Network, gave each company a stage and 10 minutes to convince a panel, chaired by Boeing and comprising specialists from Airbus, Thales Alenia Space, Lockheed Martin, Inmarsat, Earth-i and SSTL to invest in their business. SETsquared, a multi-award-winning enterprise collaboration between five leading research-intensive universities, partnered with the UK Space Agency in 2015 to create the UK Space Incubator Network – a network of incubators dedicated to identifying and accelerating the growth of start-up and scale-ups that are leveraging space technology in their businesses. In addition to the Network, the partnership spawned an incubation support programme for business and technology ideas that utilise space tech, such as GPS, 5G, location or satellite data. To date, SETsquared’s Entrepreneur’s Programme, which also covers digital and health innovators, has supported over 500 participants, with latest figures showing that its graduates have gone on to raise over £8 million investment and generate more than 200 jobs. Several of the companies chosen that pitched for funding, partnerships and collaboration are alumni of the programme, with all of them boasting pioneering products, covering everything from nanotechnology, through to drone tech and cyber security. Lexicon – a start-up developing new technologies for commercial space activity, industry, entertainment and government. Working with nanotechnology, optics, augmented and virtual reality, its systems are powered by big data and managed by artificial intelligence. Oxford nanoSystems – develop innovative coatings that demonstrate significant improvements in heat transfer. This results in a reduction in the size of HVAC systems by up to 70 per cent, increasing efficiency and reducing energy usage and carbon emissions. Spotlight Data – who build platforms and applications that provide insights and actionable intelligence with unstructured data. Its UI driven data intelligence platform ‘Nanowire’ captures, processes, analyses and stores data. Vidrona – a company utilising drones and space tech-enabled analytics, with its proprietary computer vision, machine learning and AI algorithms, to generate valuable insights for the energy and utilities sector. RazorSecure – a leading provider of cyber security solutions for operational technology (OT) systems. Its RazorSecure Delta platform uses machine learning to detect anomalies and attacks on critical infrastructure. SATAVIA – an environmental data intelligence platform that enables airlines, OEMs and others to reduce the financial impact of unscheduled engine and airframe maintenance caused by ice, dust and corrosive air pollution.